CyberForce Competition team members from Whitworth University in Spokane debrief with a Red Team member, a.k.a. the designated hackers, to assess the team's performance during the daylong competition at PNNL. There was no time to get too comfortable at the CyberForce Competition at PNNL as Washington State University team members work to thwart a continually evolving cyber threat. RICHLAND, Wash. — Teams representing 14 colleges and universities from the Northwest, and as far away as Indiana and Texas, converged on the Pacific Northwest National Laboratory campus at the beginning of December, to compete in a contest over how to best defend America's energy infrastructure from cyberattacks. The teams competed against one another as well as against 55 other institutions competing simultaneously in similar environments at six other Department of Energy national laboratories across the country. While the atmosphere in PNNL's Discovery Hall may not have been as noisy or crowded as a college football stadium on a fall Saturday, the competition seemed no less intense, with team members continuously collaborating, strategizing and maneuvering to stay ahead of the changing threat, all the while maintaining an optimal balance between security and availability. "I've got a much better understanding of what it means to be in cybersecurity," said Carter Moore, a Washington State University senior from Sammamish, Wash., who is competing in his second CyberForce Competition. "It's fun to be around so many people working on the same thing." This year's regional winner at the PNNL venue was Oregon State University. Western Washington University received the 256th Intelligence Squadron Award from the Washington Air National Guard as the top performing team from Washington State and national honors went to the University of Central Florida team. Teams participating in the CyberForce Competition at PNNL included: Columbia Basin College, Green River College, Highline College, Indiana Institute of Technology, Oregon State University, University of Idaho, University of Texas at Dallas, University of Washington Bothell, University of Washington Seattle, University of Washington Tacoma, Washington State University, Western Washington University, Whatcom Community College and Whitworth University. Cyberthreats to the nation's energy infrastructure represent both a critical challenge and an opportunity for students entering the workforce. In an industry survey released last month by the consulting firm KPMG, nearly half (48 percent) of power and utility industry CEOs surveyed said cyberattacks on the power grid were not a matter of "if" but "when," and nearly 60 percent of those CEOs identified cybersecurity specialists as "the most important new role" in their companies. "The threats we face today are unprecedented in number, scope, and complexity," PNNL Director Steve Ashby told participants and attendees in his opening remarks at the CyberForce Competition. "Tackling threats of this magnitude requires that we grow a highly skilled and dedicated cybersecurity workforce, particularly at a time when our nation is facing an alarming shortage of cyber practitioners." This is the second time PNNL has hosted the CyberForce event. 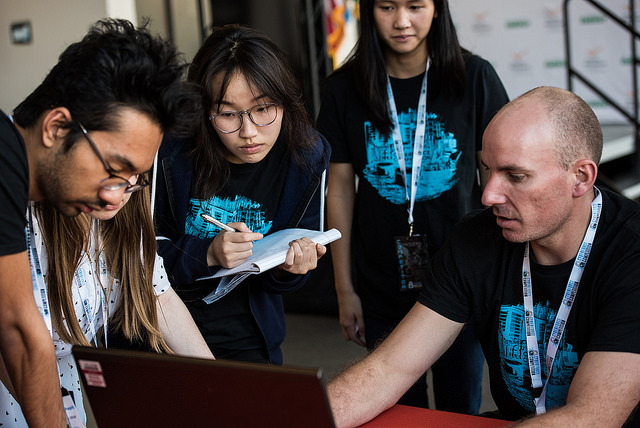 In this scenario, students competed to build and defend a simulated oil transportation network, power delivery system and high-performance computing system from cyberattacks by hackers, while maintaining service for their customers. Hackers and customers were played by cybersecurity professionals and government representatives. "The CyberForce Competition is one of many ways DOE promotes the development of a workforce of cyber professionals with competencies relevant to the energy sector, while raising awareness of cutting-edge cybersecurity and critical infrastructure innovation happening in the department and across the national laboratories," said PNNL organizer Ann Wright-Mockler. "Events like this aim to encourage students to consider careers in this high-demand field and help drive growth of the workforce," she added. "The competition also aims to help students develop the teamwork and technical skills needed to succeed in future cyber roles." Find more information about the DOE's Cyberforce Competition here.